Despite the fact that history has never been my favorite subject, historical fiction--though I haven't read much of it--is one of those very few genres that almost always works for me. Of course, certain time periods sound more intriguing than others, like the era of Hitler. Maybe it's because the Holocaust is so universally known and remembered and atrocious that makes it more...well, interesting isn't the right word, but reading something somewhat familiar and that I actually know about is nice. And yet, even though the book contained the character of Hitler and had gotten a lot of love from other readers, Prisoner of Night and Fog sat unread on my Kindle for over three years. Until now. Sometimes I read a book and wonder why the heck I didn't read it sooner. Prisoner of Night and Fog is one of those books. Maybe I just picked it up at the right time, but still--I could've read this gem three freaking years ago. I didn't even intend to read it when I did; I was just browsing through my Kindle, trying to see if anything would catch my mood. I only meant to read a page or two, give it a try. Instead I never really stopped. This book was good. There's something about historical fiction--the mood, the prose, the voice--that, if done right, can just hit the spot. And Anne Blankman's debut did just that. Of Prisoner of Night and Fog takes place in 1930s Munich, before the Holocaust really begins. Hitler's around and running the National Socialist Party, but his inherent evil and the termination of Jewish people has to be really known. The story follows Gretchen Müller, a German girl who's grown up around Hitler, knowing him as Uncle Dolf. But we soon see that Gretchen, though she believes in Germany and her dear uncle (whose alive because her now deceased father saved him), may not fully believe in the methods and brutality being used. And with the help of Daniel Cohen, a reporter--a Jewish reporter--who can see that Gretchen may not be like all the other Germans, she starts to become a different person and search for the truth. I really, really liked this book. Like, a lot. It certainly wasn't perfect; some scenes didn't feel super solid and the romance was a little quick. But it's one of those books that are so good that I don't really care about any perfections. I liked Gretchen and seeing a person who was in a situation where she didn't know any better--but then learned and saw what better was. She was an average and simple girl, but she fought to be more. I adored Daniel, and he and Gretchen are so sweet and tender together and I just love it. They're two good people stuck in a corrupt world and trying to find their way out. And it was interesting to see Hitler before he was really Hitler, see how he was the fuel that sparked the flame, how people would so blindly follow him, and how he sometimes seemed like any other man. (Of course we, on the other side of history, know the truth.) It's all the slight calm before the storm, the ripple before the wave--and I loved reading it. I don't know why I don't read more historical fiction since it almost always, always tends to float my boat. 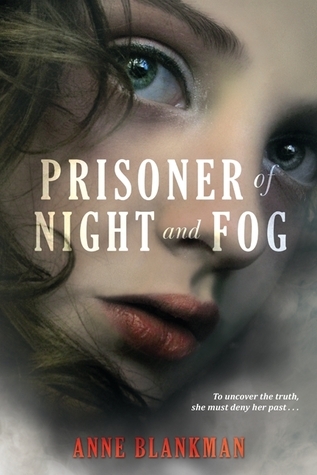 And if Of Prisoner and Night Fog goes to show for anything, I really should be reading more historical fiction. I can't help but make a little pun and say that this book held me prisoner. The story it tells isn't a good one, and we all know how it ends--in real life. But this is fiction riddled with truth, so we don't know, don't have a clue, what the fate of some of these characters might be. Especially when one is a wary, seeing German and the other is Jewish, and they live in a world where Hitler is everything. I do know one thing: once I finished Of Prisoner of Night and Fog, I was sorely disappointed. Why? Because it was over. And I didn't--and still don't--have the freaking sequel. Did I like it? Most definitely. Did I love it? Not quite, but I super duper liked it. Would I purchase it? Absolutely. Who would I recommend it to? Fans of historical fiction, people who don't mind reading about Holocaust-related things, and those who don't mind their history with some liberties--like a lovely romance worth rooting for.